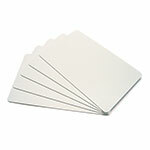 125kHz low frequency cards, in standard smartcard sized formfactor. EM4200 is a CMOS integrated circuit intended for use in electronic Read Only RF transponders. It is designed to directly replace the EM Microelectronic-Marin Read Only ICs EM4100/4102 and EM4005/4105. The 128 bit unique code is stored in laser programmed ROM. Contact us for datasheets or volume orders. EM4305 is a CMOS integrated circuit intended for use in electronic Read/Write RF transponders. It is suitable for low cost solutions like animal tagging applications. The IC communication protocol is compatible with the EM4469/4569 family. The HITAG product line is well known and stablished in the contactless identification market. 256 bit total memory (Read/Write). chip together form a transponder or tag. The on-chip 363-bit EEPROM (11 blocks with 33 bits each) can be read and written block-wise from a base station (reader).